Death begins in the colon. Some 200,000 people die yearly from problems in the digestive tract, most notably colon cancer. These disorders result in 60,000,000 doctor office visits and with costs in the millions. Problems such as constipation, gas, irritable bowel syndrome, diverticulitis, fatigue, skin & hair problems, and colon cancer, are just some of the diseases that occur from a unhealthy digestive tract. Any coroner will confirm the fact that many colons are impacted with several pounds of waste matter. Most people would benefit from a cleansing of the digestive tract. 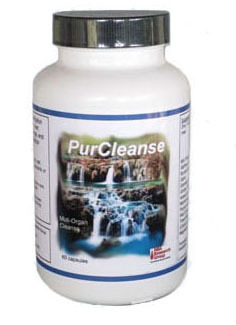 The PurCleanse product is a proprietary blend of several natural ingredients that aid in the cleansing and restoration of the digestive tract to a healthy state. Below is a list of the all natural plants and herbs.